Bletchley Ladies tasted a rare defeat on Sunday when they were knocked out of the Women’s National Intermediate Cup at the semi-final stage by Harrogate. 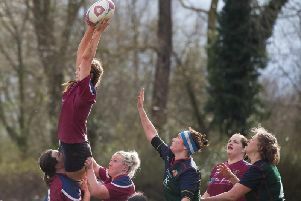 Having clinched the league title last week, they had eyes on a second cup final with the Intermediate Cup in the offing, but the 61-5 thrashing put paid to their chances. Bletchley have not seen the last of Harrogate either, with the sides ready to lock horns in the play-offs on April 7 in their attempts to be promoted to Championship 1 North. Within two minutes of kick off, Bletchley found out what they were up against, with Harrogate running in their first try. They took the opening kick, sending it deep into Bletchley’s territory. Beth Metcalf took possession and ran back, then passed along the line. A few more phases saw Bletchley gain some ground, then they were pushed back. A loose ball was secured by Bletchley, who set up a ruck on their 22. Harrogate ripped the ball, passed along the line and ran in their try; 5 – 0. Bletchley’s restart kick, head on into the wind, didn’t make 10, giving Harrogate a scrum on the half way line. Their 8 picked from the back and drove forward, then Metcalf ripped the ball from a ruck. Bletchley began to claw back some ground, helped by a penalty from their hosts, moving play to the middle of Harrogate’s half, with Bletchley having the honours at the lineout. They secured this, set up a maul, then peeled off the back and passed along the line. Betty Susova drove play forward and Bletchley continued to work through the phases. Another penalty from Harrogate was taken as a quick tap and progress continued. As the 22 was in sight, Harrogate kicked a loose ball dropped in a pass. Jodie Dimmock gathered it up and Bletchley took back lost ground. Bletchley made it back to Harrogate’s 22, only to lose possession again with Harrogate intercepting a pass. They set up a ruck, then passed along the line. An opening gave them a break which took them right down the pitch for their second try, five minutes in; 10 – 0. Harrogate took the ball from the restart, but Bletchley dug in and worked till they took possession, moving play up to the middle of Harrogate’s half. They worked through their phases, then a knock on gave Harrogate the scrum; Bletchley took this against the head and continued to push. Clare Stacey put in a strong run, but was tackled out 10m from the line. Harrogate secured their scrum and moved play up to the halfway line. A knock on and Bletchley had the honours at the scrum. They pushed back into Harrogate’s territory, then lost the ball at a ruck. They worked across and down the pitch, then tapped over into Dimmock’s hands, in the middle of Bletchley’s 22. A penalty form their hosts gave Bletchley respite, allowing them to move play back to the middle of the pitch. Another penalty, and Bletchley had a line out mid opposition territory. They secured this, worked forward, then kicked up to Harrogate’s 22, where Harrogate took the catch. They worked back up the pitch and, despite a strong defence from Bletchley, took their third try; 15 – 0. The next ten minutes saw Harrogate run in three more unconverted tries to take the score to 32 – 0, despite a yellow card for a high tackle leaving them a player down. From the restart after Harrogate gave another penalty in the middle of the pitch. Bletchley kicked to touch, though the wind prevented this from going too far, giving them a line out 20m into the opposition’s half. They popped the ball down form this, passed out to Jodie Denton, who drove play forward. A few more phases, then a knock on let Harrogate back in. they moved play back into Bletchley’s half, then gave another penalty. Bletchley took a tap and slowly gathered back ground. They worked through their phases, then Isla Peters drove through to gain more ground, the ball passed along the line, then another drive, this time from Millie Lee, added to the momentum. Another penalty further helped Bletchley’s cause, then a loose ball was gathered up by Harrogate, and all the hard work was in vain. They moved back up the pitch, then were tackled out, giving Bletchley the line out. They secured this, only to have the ball ripped from a ruck. Harrogate passed out from their ruck and ran for the line, with Bletchley chasing hard. They caught up and put in a strong tackle, but the player was too close to the line and the drive from the tackle took her over for Harrogate’s final try of the half; 37 – 0. Bletchley came back fighting after their halftime talk; unfortunately, the wind had also dropped and was less of a hindrance! Harrogate took Bletchley’s opening kick and ran back at their visitors. A penalty from Bletchley was taken as a tap, then Harrogate returned the favour with a penalty of their own. Bletchley tapped and passed out to Denton, who ran it up to Harrogate’s 22. Another high tackle from Harrogate gave them their second yellow. A quick tap was passed out, then knocked on to give Harrogate a scrum in the middle of their own 22. Bletchley pushed Harrogate off the ball and took possession. A strong push from Rachael Appleby was countered, another from Metcalf, followed by a third from Susova; Harrogate were not going to make it easy. The ball passed out, then Bletchley were tackled out, to give Harrogate the line out, 5m from their line. They secured this, then kicked to clear their lines; Alex Sutton took the catch and ran it back. The ball passed out to Susova, who took it over the line to get Bletchley on the score board. The conversion was charged down; 37 – 5, after six minutes of play. Harrogate chased up their restart kick and took possession. A penalty from Bletchley helped their cause, but generally, both teams just dug in. play moved up and down the pitch, and Harrogate’s frustration was beginning to show, when they gained themselves a penalty for questioning the referees’ decision over a knock on. A full half hour passed before the next points went on the board. Harrogate had moved up into Bletchley’s 22, but Bletchley were dug in. Harrogate gave several penalties in their attempt to get past Bletchley’s defence, but Bletchley remained dogged. Harrogate were just as strong in their line, and despite the penalty advantages, Bletchley couldn’t break out of their 22. Finally Harrogate’s persistence paid off and they managed to get the ball down between the posts; despite this, the conversion still failed, leaving the score at 42 – 5. The effort of their defence was beginning to show in the pace of Bletchley’s game, and Harrogate managed to run in three more tries, one of which they converted, before the final whistle went, leaving the final score 61 – 5.